Thanks to Maeve Maddox at DailyWritingTips.com for this idea. Not long ago, I posted an article and graphic about the creative and varied names for animal groups. 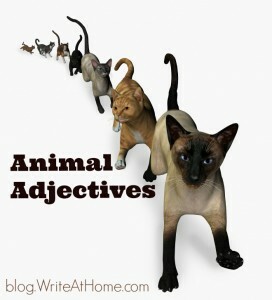 Today, I’d like to talk about animal-related adjectives. Fascinating. I didn’t know lupine was wolf-related. I knew that from Latin. Considering the Latin origins and etymology of “lupus”, I can’t imagine WHY this would be unknown or even the least bit surprising. lupus (n.) late 14c., used of several diseases that cause ulcerations of the skin, from Medieval Latin lupus, from Latin lupus “wolf” (see wolf (n.)), apparently because it “devours” the affected part. Ohhh, that’s a nice resource to have!